Mange is a skin disease caused by a parasitic mite that lives within the skin and hair follicles of pets. 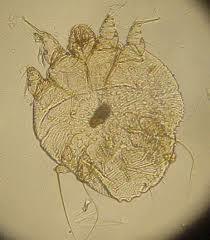 There are two commonly seen mites in our pets in Australia, these are demodex and sarcoptes. 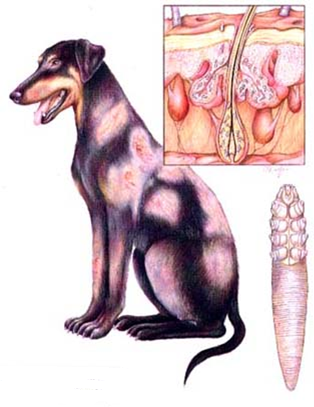 Demodex mites are ‘normal’ mites and most dogs have these at extremely low levels. Sarcoptic mites are a contagious mite. Puppies get these mites whilst feeding from their mum. They usually live at extremely low numbers in the skin and do not cause any problems. These mites are NOT contagious. Demodectic mange is most commonly seen in young dogs (<1year old). 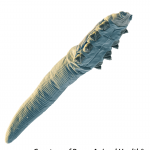 Demodex mites often multiply causing hair loss and predispose the skin to secondary bacterial and fungal infections. In order to diagnose demodex mites we need to take a skin scraping, this involves using an instrument such as a scalpel blade to scrape the skin—not cut it—in order to scrape mites out from within the skin layer and hair follicles. 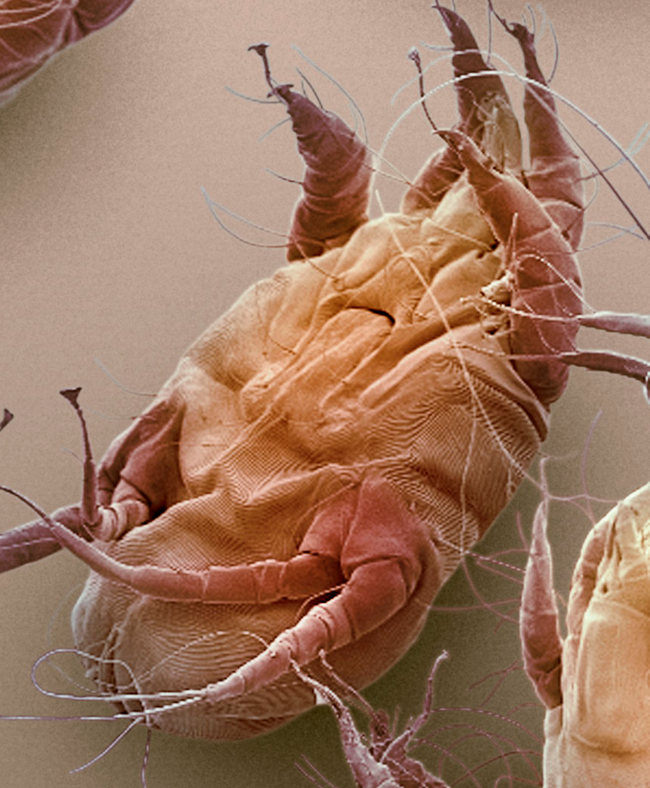 These mites live deep within the skin so a ‘deep’ scraping is necessary. The mites are only visible under the microscope and can sometimes be difficult to find, even in an apparently ‘mangey’ dog. Treatment of the mites can be difficult and frustrating. Occasionally, a dog will only have 1 or 2 small areas that are affected and can be left without treatment. However, once there are more then 5 patches or the hairloss is widespread then treatment is important. The treatment is an antiparasiticide in either an injectable or oral form. 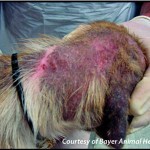 A minimum of 6-8 injections are usually required before we will then repeat a skin scrape to ensure the mites are gone. We will then often continue treatment for another 2-4 weeks to ensure the mites have resolved. In difficult cases we will continue treatment until we get 2 consecutive negative scrapes, 4 weeks apart. It is common for the skin to initially (first 1-2 weeks) look worse, before it starts to improve. Often there are secondary infections present, for this we will often prescribe a course of antibiotics and recommend a medicated shampoo. Sarcoptes or ‘scabies’ is less common. 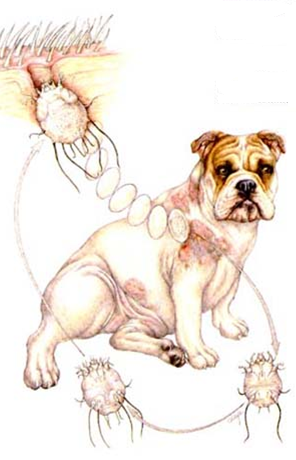 These mites cause an intense itching and hair loss and dogs frequently transmit the mites to their owners. Sarcoptic mange is transmitted from wild dogs, foxes or other infected ani-mals. Treatment is similar to demodectic mange, however a less intensive course of treatment is required. Sarcoptic mange also responds well to Advocate or Revolution spot on treatments when applied every 2 weeks for three treatments. Once the mites (demodex or sarcoptes) are treated they rarely recur if the full course of treatment is instituted, unless there is an underlying condition. If they do recur, we will often suggest skin biopsies and further investigation into why your pet is immunosuppressed.